Special Containment Procedures: SCP-723-J is to be contained in the second-floor experimental lab utility closet. As SCP-723-J is allowed to roam this area freely, personnel entering the area are to remain vigilant. Retrieving SCP-723-J from within premises ("tactical wrangling") is a low-priority exercise, to be given only to unoccupied wranglers. Description: SCP-723-J is a Periplaneta americana (American cockroach) believed to be of advanced age, possessing characteristic downwards-slanted antennae. Dr. █████: He must be in a rough spot if he’s hanging out in the lab areas. It’s too cold for his species in there. I hope he finds his way outside where he belongs. Dr. ██████: I felt bad for him since he seemed so lonely. 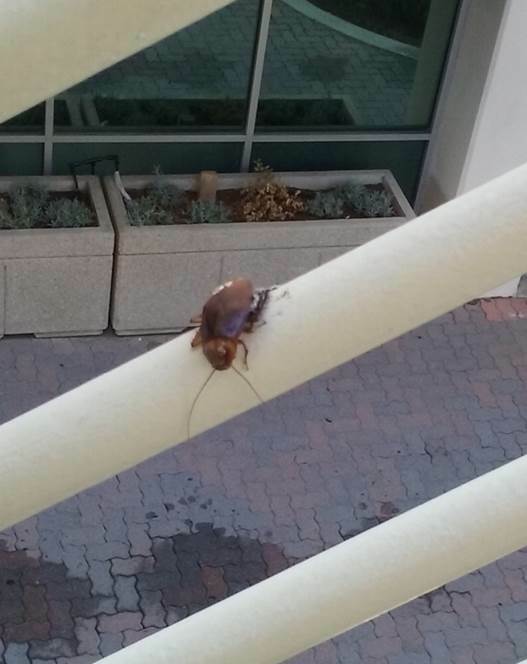 I’ve actually never seen another bug in here, so I guess he must have lost his family. Maybe his mate too, if he had one. Poor guy. Jr. Researcher ███: I think that maybe the roach's sister had roach syphilis and the roach tried to save her but he couldn't crawl fast enough and now the roach lives forever because that way the roach sister lives on. As a feeling in his roach heart. Researcher █████: Maybe when he was a roach larva Roy Orbison was his hero because whenever his mom and dad fought he would run to his corner and watch Roy Orbison on the TV so he wouldn't hear them yelling. And one day his parents fought so loud that Sad Roach ran away and bought a bus ticket to Nashville to learn guitar like Roy Orbison. But when he got there the music teacher took one look at him and said that he could never play guitar because he had six legs and no hands or fingers. And he went to live in a diner and waits for the radio to play one more Roy Orbison song and thinks about what a fool he's been because he can't play guitar because he is a roach. Technician ███████: I saw it on my keyboard yesterday and thought "it must be tough to be that ugly." Upon initial contact, SCP-723-J was found on a railing in Site-19 staff parking structure 39-K. Site maintenance was informed, but SCP-723-J disappeared during the time taken for dispatched personnel to arrive. SCP-723-J was later sighted in the second-floor laboratory rooms, and most frequently in the lab's utility closet. Staff has agreed per consensus to allow SCP-723-J to live out his dreams to be a janitor with the cleaning supplies, as it is a much better alternative to the roach motel he previously worked at and he needs some time away from his delinquent younger brother. It is currently unknown how SCP-723-J manages to sustain itself, as all edibles in close proximity to its containment are held in secure storage. Nevertheless, SCP-723-J sightings remain a relatively common occurrence, though SCP-723-J has been observed to flee immediately upon confrontation. Dr. ██████: [extraneous dialogue removed] So how did the briefing go? Agent ████: Decently. I— hang on, there's something under the cabinets. Dr. ██████: What? Which cabinet? Agent ████: The one with the snacks. Looks like a roach. I'll get it. Dr. ██████: Wait, that could be sad roach! [Agent ████ swiftly approaches and crushes SCP-723-J using standard Foundation-issue footwear] Be careful with sad roach! Agent ████: …the cockroach that you and Dr. █████ were talking about last month, that neither of you could squish no matter how hard you tried? I just thought it was fast as hell and you couldn’t catch it. They're health hazards, you know. Agent ████: If it makes you feel better, it was, uh, a worthy foe. But I'm just going to scrape this into the trash now. As of ██/██/████, SCP-723-J is confirmed neutralized. Due to a perceived record of intense hardship, SCP-723-J was posthumously awarded the Dr. Blattodea Lifetime Achievement Award and the E-112 Marine Incineration Protocol. As Foundation interns were unable to fully retrieve SCP-723-J or its remains from the wastebin, the boot used during SCP-723-J's improvised non-emergency termination was burned following a brief, informal closed-shoebox ceremony. ██ personnel were in attendance.